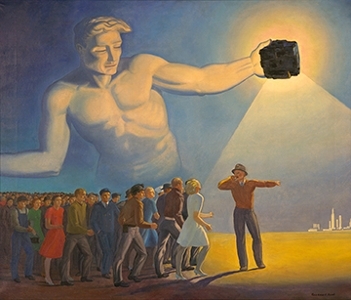 This special exhibition features a highlight of the Purdue Galleries collection, “Generator of Jobs,” a painting by American artist Rockwell Kent from 1946, and positions the work as a source of inspiration/discussion along side the works of local, regional, and national contemporary artists. Included will be additional collection works from Purdue Galleries, the Art Museum of Greater Lafayette, and the Dayton Art Institute (OH). Featuring new artworks inspired by a singular piece from the collection highlights the “nucleus” work in a unique fashion, illustrating how it can be viewed by contemporary artists from a variety of perspectives.